It’s often said that the youth of today have no respect for their elders. In certain instances, that’s perfectly true; young people should show more appreciation for those who helped build our country as we know it today. However, it’s not always the case. There are plenty of actions performed each day by young people that deserve to be raised into the spotlight. This is one such story. It’s my hope that we can help it to spread, and that as a result it cause ripples on the pond that go on to affect a large number of people. 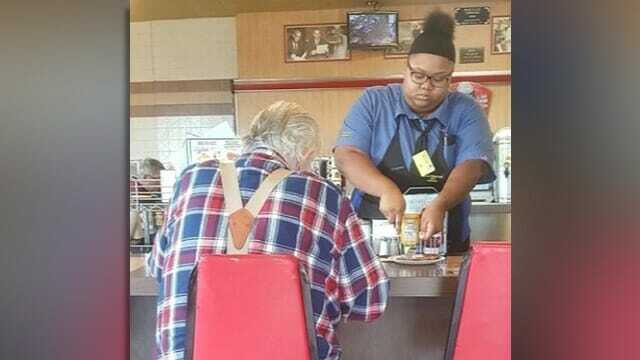 Last Saturday, 18-year-old Evoni Williams stood behind a counter and worked her usual shift at Waffle House in Houston. It was there that she noticed an elderly man requiring the support of an oxygen tank. He was struggling to cut his food apart. The old man’s hands didn’t work as well as they once had, so Evoni reached out to him in a bid to help. “Without hesitation, she took his plate and began cutting up his ham,” wrote patron Laura Wolf. She was so touched by the action, that she uploaded a picture of it to Facebook. “This may seem small, but to him, I’m sure it was huge,” Wolf continued. 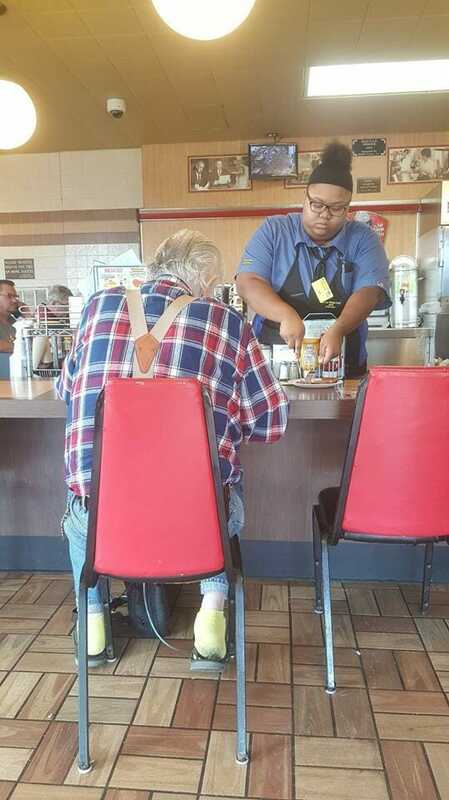 Almost a week later, this act of simple kindness has been shared more than 40,000 times on Facebook, according to US news sites. 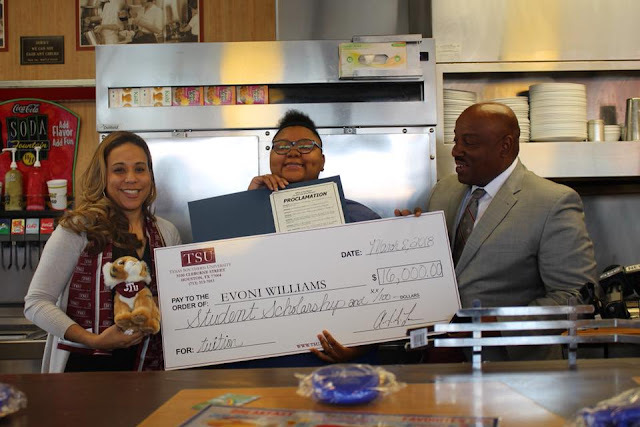 Furthermore, the picture soon reached the Texas Southern University School, who haveapparently offered Evoni a scholarship worth $16,000. 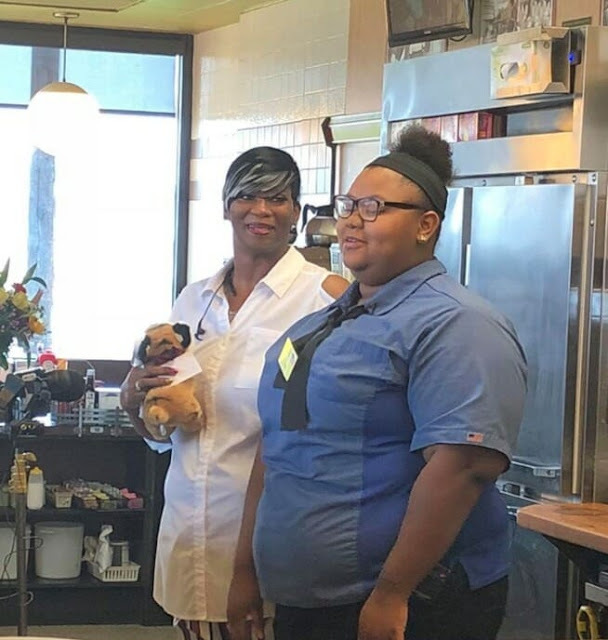 It was a life-changing gift for Williams, who graduated from high school in May and has been working at Waffle House since then to save money for university. The girl herself said that she was honoured by the praise and appreciation, but that she didn’t see her actions as being anything out of the ordinary. “I didn’t know the photo was taken until a couple hours later,” Williams told the Houston Chronicle. According to the 18-year-old herself, it was obvious that she should be helping the old man. Such stories really warm the heart. The world needs more special people like you, Evoni. It’s great that this wonderful act led to a scholarship. Please share this story on Facebook. Perhaps it will inspire more people to perform charitable acts in their every day lives.